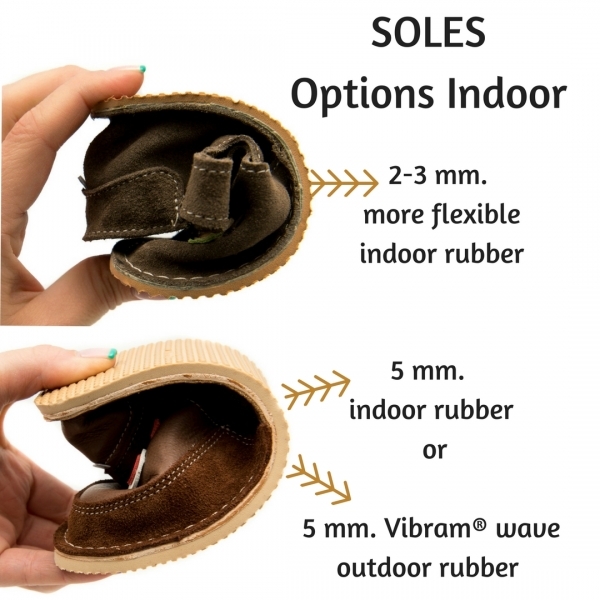 Indoor moccasins with velcro strap fastening. Sizes EU 18/19 - 30/31. 100% genuine leather: soft, light, easy to slip on. Shoe width around the ankle is regulated with a velcro (hook-and-loop fastener). Appropriate for indoor use, kindergartens, yards and walking outside in a warm dry weather. 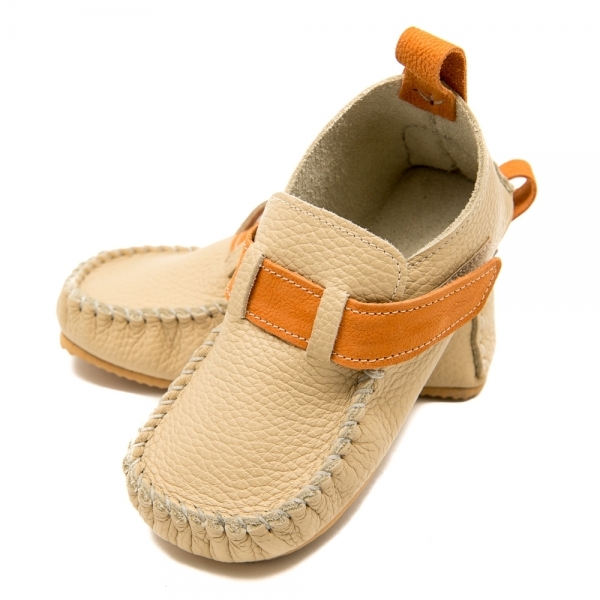 Moccasin models feature incredible comfort without stitching and edges to press on and injure the little feet. All edges and contours have been hammered in or pointed outwards. Our slippers gratify the needs of the grown baby feet making their first steps. They are designed for toddlers - the flexible construction of the slipper are engineered to render a barefoot feeling as close as possible. Toddler shoes must not limit the free movements of the growing baby feet, nor deform, press on and constrict them. ZEAZOOkids recommends: This model is more appropriate for kids that are walking. For first steps we recommend model 102, with a lace around the ankle, which fastens the moccasins better and they stay better on the little unstable feet. - 2 mm thin micro-cellular rubber, flat, light- weight and very flexible. - 5 mm micro-cellular rubber, flat, light- weight and flexible - appropriate for kindergartens, where the child spends a lot of time, in-door. Your baby can wear them with or without socks. The air circulation is very good because they do not have glue and a lining.